What a gorgeous day we had today in Tennessee! The sun was shining and a warm breeze was blowing! What better to do than hang around the farm and enjoy the animals and the beautiful weather! Today was a big day for my little kids: Chilly, Willy, Nutmeg, Patches, Waddles & Cocoa. It was the BIG SEPARATION! Time to leave mama and be big kids! I put the moms in the larger pasture with studs Samson & Flip. None of the girls are in heat yet but I’m sure they’ll be bred again for summer kids. After these kids, those moms will be given a year off – no more breeding for them for a while. The separation went well – there was a lot of bleating but the I think the moms were happy for the break. The kids followed the moms on this side of the fence and stayed as close as possible. I locked the kids up for the night so none would try to put their heads through the fence again! Sweety & Gracie got to stay in the main pasture with the kids. Sweety is just too young and too little to go through birthing again. I’m not going to breed her until later this year for spring 2010 kids. Along with the 6 kids named above, Booger, Molly & Annabelle are also in the main pasture. Booger is just a baby, Molly (the one & only Fainting goat), was bred earlier to my PeeWee Pygmy stud – maybe I’ll have a new line of PeeWee fainters, and Annabelle, well she’s just too special to breed. She’s old enough but I’m not sure she’d know what to do when the time came to birth. You see, Annabelle is “mentally challenged”. She’s very sweet but not quite right… She’s also always picked on by all the other goats – even those littler than she is! Bambi, Boo, Blue & Java will join the older goats sometime between March & June. These 4 are a very small line of Pygmys/Nigerians. I call these my PeeWee Pygmys (as are my studs, Samson & Flip). Stormy hung around and enjoyed the hand fed treats. Ziggy is playing hard to get – he’s free in the main pasture but drags a 4 foot leash. I’m hoping to catch him tomorrow – he should be hungry by then! Scott spent several hours with me at the farm and of course had his camera handy. He took several pictures that I’d like to share with you. Enjoy them and please comment if you feel inclined! 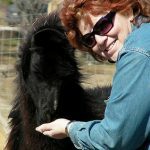 I just love your llama! He looks so friendly and sweet. Stormy is awesome… I’ve been offered his half brother but I’m afraid he won’t be as sweet & Stormy will pair up with him and abandon the goats!